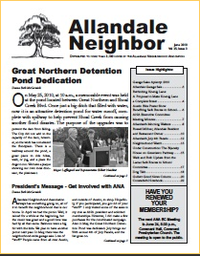 I just received my June edition of the Allandale Neighbor on my doorstep. I hope you did as well. In this issue we welcome writer Walter Brewer. He contributed two articles, one on a group of walkers, some or all of whom you may recognize – especially if you're out and about in the neighborhood early in the morning. He also wrote an article on a new home under construction on Greenlawn Parkway. We don't have many new homes going up in Allandale. I think you will find this one somewhat unique. Welcome Walter. In this issue we also cover the dedication of the much improved detention pond, the very successful 2010 Garage Sale, the first Austin Bike Poster Show, Minutes from the April EC meeting, and a most interesting possibility for Koenig Ln. Once again, your newsletter staff brings you a great read! Thanks to all contributers and to our every reliable Cathy Savage who takes care of the layout and Jen Welch who takes care of readability. We're your neighbors! As always, send along your story ideas, reactions to stories, and opinions to allandaleneighborh [Email address: allandaleneighborh #AT# gmail.com - replace #AT# with @ ]. Contact me if you do not receive your newsletter by Friday. Katie Larsen’s proposal for making Koenig Lane “a complete street,” which you, Tom, with deft and frightening political nicespeak, label as interesting, has all the appeal of resurrecting curb islands. I beg you not to lead this neighborhood back in to a long protracted fight that makes even less sense than the Shoal Creek Blvd debacle. Steck and Hancock provide east west bike lanes. To propose that we convert Koenig Lane into a two lane vehicular east west bottleneck, with a chicken lane, a virtual Burnet Road lite, for the sake of additional east west bike lanes is unspeakably audacious. Driving this route east west in rush hour speaks for itself with all the clarity brought on by simple common sense. Yes, I remember when we who advocated simple common sense in the early days of the 7 plus years of traffic calming projects on Shoal Creek were called old fuddy duddies and “stick in the mud over-the-hill” obstacles to 21st century progress who needed to be good citizens and buy into the goals of staff bicycle advocates hired by the city of Austin. It is incomprehensible to me that we may once again be on the verge of the ignorant and disbelieving majority being railroaded by an incredibly passionate and persistent tiny minority.